Hail and ho ho ho Satan! After a protracted fight with the state officials, the Satanic Temple will be allowed to put up a holiday display in Florida's state capitol building, depicting an angel plummeting into a lake of fire. It's the same holiday display that Florida's Department of Management Services rejected last year as "grossly offensive." The rotunda played host to a six-foot tall "Festivus" pole – a reference to a fake holiday featured in the 1990s sitcom "Seinfeld" – made out of 14 empty cans of Pabst Blue Ribbon beer. Not far from that was a depiction of the Flying Spaghetti Monster, a symbol of a web-based parody religion often associated with non-belief. But there was one symbol that was not welcome: A display proposed by the Florida affiliate of the Satanic Temple was denied space in the rotunda because state officials felt it was "grossly offensive." Temple members disagreed, but state officials ignored the Temple's request to identify what about the display was offensive. 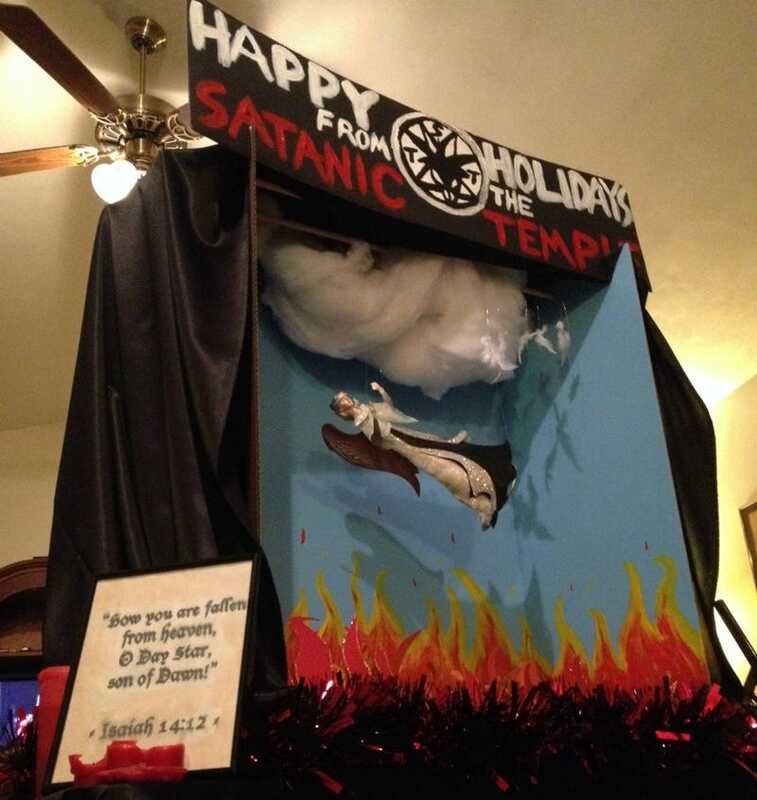 Satanic Temple spokesperson Lucien Greaves — who will also answer to the name Doug Mesner — tells Jezebel in an email that while he's pleased Florida has come around, he suspects it's only because the Temple was armed with a "cadre of lawyers," which, he writes, "apparently rendered our homemade holiday display more palatable to the DMS's tender sensibilities." The display that has been approved this year is exactly the same display that was rejected as "grossly offensive" last year. Florida's Department of Management Services declined to comment as to what, exactly, they judged to be "grossly offensive", and we were left to conclude that we were being subjected to blatant viewpoint discrimination. This time around we arrived with a cadre of lawyers working with Americans United for the Separation of Church and State. This apparently rendered our homemade holiday display more palatable to the DMS's tender sensibilities. In any case, the correct decision was finally made, and we appreciate the opportunity to publicly wish a happy holiday season to all. Nobody holds a monopoly upon the season's celebratory spirit, and we hope that our display, among the various others, will contribute to a general and growing understanding of plurality. If there is fun to be had, we'll have it — and we wish the same for all, regardless of religious affiliation, or lack thereof.